The combination of raspberries and lemons epitomizes summer in my book. There is sweet simplicity about this flavor duo that just works together to form some seriously stunning desserts. When I was asked to help bake a few sweet treats for our end of the year luncheon at work, I thought this blend of fruit would be the perfect way to kick off our summer vacation. I like making cupcakes for functions because they have such a high level of portability. They allow people to grab one and go about their day while savoring something delicious. The tulip cupcake/muffin wrappers I baked them in added a little level of uniqueness to a very delicious cupcake. People were intrigued my these little yellow paper wrappers and thought I made them myself. I am betting they can be easily replicated with parchment paper, but I picked mine up at the local cake decorating store. For the cupcakes, I used my favorite cake recipe from Dorie Greenspan and topped them with a big swirl of raspberry buttercream. Beware…this frosting may force you to lick the bowl, spoon, beaters, spatula and maybe even your fingers! Yeah, it’s that good, so don’t say I didn’t warn ya! 3. Put the sugar and lemon zest in a mixer bowl or another large bowl and rub them together with your fingers until the sugar is moist and fragrant. Add the butter and, working with the paddle or whisk attachment, or with a hand mixer, beat at medium speed for a full 3 minutes, until the butter and sugar are very light. Beat in the extracts, then add one third of the flour mixture, still beating on medium speed. Beat in half of the milk-egg mixture, then beat in half of the remaining dry ingredients until incorporated. Add the rest of the milk and eggs, beating until the batter is homogeneous, then add the last of the dry ingredients. Finally, give the batter a good 2-minute beating to ensure that it is thoroughly mixed and well aerated. Place the batter into the cupcake tins. 4. Bake for 18-22 minutes, or until the cupcakes are well risen and springy to the touch – a thin knife inserted into the centers should come out clean. 1. Cream the butter and shortening in the bowl of an electric or stand mixer. Add extracts and raspberry puree and combine well. 2. Begin adding in the sugar and mixing thoroughly after each addition. After all of the sugar has been added and mixed thoroughly, begin adding the very cold milk… one tablespoon at a time, combining very well after each addition (mixer on medium-high to high speed) until you reach the desired consistency. *If you don’t have raspberry extract, simply add a little bit more raspberry puree until you reach your preferred level of raspberry flavor. If you add more puree, cut back on the milk. *If you do not like to use shortening, simply sub in butter. The frosting will not be as structurally sound, but will taste just as delicious. I made these for a bake sale, and they were a huge hit!! 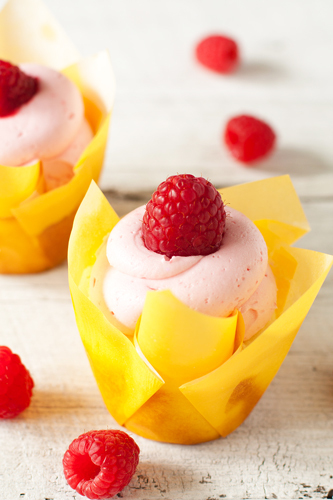 They are so delicious and have the perfect blend of tart fruit and sweet creamy frosting for summer. They completely sold out when I made them! These look delicious! I’d like to make 12 cakes though instead of 24, is there anything I need to know about cutting the cake and frosting recipes in half? Thanks! These look so delish! Can’t wait to try to recipe!! I wanted to make strawberry lemonade cupcakes and was debating lemon cake with strawberry buttercream vs. strawberry cake with lemon buttercream when I came across this recipe. Debate settled! :) The lemon cupcakes were divine. I substituted strawberry puree for raspberry and added a little bit of fresh lemon juice to the frosting as well. I made them for some friends celebrating their 12th anniversary and also for a back-to-school dessert social. Everyone loved them, can’t wait to try more recipes! In short, these were heaven in a cupcake. The cake was a light and fluffy as they come and the frosting was tangy and delicious! I cannot bestow enough praise on these cupcakes. Thank you thank you thank you!!! How did you achieve that awesome swirl of frosting? It’s amazing! i love the cupcake wrapper!! and lemon + strawberry is such a greeat combination!! All your recipes sound so good and your photo shots are wonderful! Thanks for sharing. What a fabulous recipe, they turned out so well! I was just wondering if I should refrigerate the cupcakes (frosted) overnight or if I should leave them on the counter in a container? That happens a lot around here too! Thanks for visiting! What tip do you use to get the frosting like that on the cupcake? To get that puffy, ‘holding my breath” look with frosting–go to the Cake decorating store and look for plain round tips. You use the small ones for piping stems on flowers, the middle-sized for lettering on cakes, but the one you want for this is the big one–probably 3/8″ in diameter, or maybe more. Hold the tip about 1/8″ above the top of the cake, and hold it straight up! Squeeze the bag until the frosting is close to the edge of the cupcake; then lift it up [just barely clear of the frosting] and squeeze again. To finish, either ‘trail off’ the frosting for that ‘DairyQueen’ look, or just stop squeezing and pull away, then garnish with goodies. If you haven’t done much piping, practice on a Silpat, so that you can ‘recycle’ the messy ones. Can you use butter flavored shortening? I don’t think I would use butter flavored shortening in this recipe. I ended up using butter flavored since that is what I had and it turned out great – so yummy! Made these for a baby shower and they were a HUGE hit – I am in LOVE with this frosting – so yummy. I want to inject it into a dark chocolate cupcake and top that with ganache or dark chocolate icing – hmmmm. Just trying to find reasons to make this frosting again and again! Thanks for the recipe! I made this raspberry frosting recipe last night and it is soooo awesome! You will not be dissapointed! I have never left a comment on a recipe in my entire life but I felt compelled to come back today and leave a comment because it is that wonderful! I will use this frosting for my sister’s baby shower cupcakes. I’m confident this is the best there is!!! Thanks so much for commenting! I’m so happy this recipe compelled you to make your first blog comment, I hope your sister’s shower is amazing! Wow these look delish and your photographs are so gorgeous. I have some strawberries in my freezer and I was wondering if the buttercream could be made with strawberries instead. I love the look of these! This was the exact combination I was hoping to use for my mini cupcakes! I will be making these for my best friends wedding? How long do the cupcakes stay good for? And I wad hoping you could tell me what type of tip you used:) These look amazing!! These were absolutely delicious and a huge hit! Only a couple problems; you don’t specify the size of the lemons you used, so it’s hard to tell how much zest should actually be added; I love zest so I wound up putting in a LOT (two absolutely huge lemons’ worth), and it worked out great. Also, this recipe makes about 2x as much frosting as I needed, and even with 2 lbs of confectioner’s sugar it had to be kept in the fridge so the icing wouldn’t drip. But the frosting is delicious, so I’ll be looking for something else to bake so I can put this icing on top of it. Thanks for the recipe! Okay – so these are the prettiest cutest cupcakes I have ever seen. So, they inspired me to try my hand at decorating cupcakes. But first, I signed up for the local cake beginner decorating class. My normal frosting is to eat it from a can with a spoon. So here I am looking for those super cute yellow wrappers, thinking I am so going to impress my in-laws with this cute little cupcake for a snack. But when trying to find them on-line everyone said they don’t bake well, absorb the oil, turn brown in the oven yada-yada-yada. So where is the best place to find those little yellow papers and what is your trick to making them so beautiful? The definitely show oil marks, but the cupcake recipe that I used does not give off a lot of oil, so I think that’s why they worked so well with this recipe. I honestly don’t remember where I bought them, but if you google “yellow tulip baking cups” you should be able to find them pretty easily. Best of luck to you! I highlighted these cupcakes on my little blog at http://wadelmat.blogspot.com/ Thanks for sharing! I don’t really like the texture of zest in my foods, is it possible to use a less amount of the zest and still have the desired taste? These cupcakes are AMAZING!!! I LOVE your website!! Does anyone know how to make this gluten free? i want to make them for a friend that cant have gluten?!?! a reply soon would be great! I just made these and wow they are good! I’m usually not a fan of fruit cupcakes, but I am converted. Opens the cupcake world right up! I was unable to find raspberry extract so just used a whole 6 oz of raspberries, yummy! I didn’t have to add any milk either. I filled my pastry bag and let sit in the fridge for a few minutes while the cupcakes cooled, piped perfectly! Thanks so much for the recipe! What tip did you use to frost your cupcakes? I use a standard M1 tip and I am bored of that. I love these original shape cupcakes. They don’t look like small cakes but like gourmet ice creams! In the Buttercream recipe, you list 1 1/2 pounds confectioner’s sugar (powdered sugar, 10x). What does the powdered sugar, 10x mean? Confectioners’ sugar can also be found labeled as “powdered sugar 10x” which is why I gave the alternate name for it in parenthesis. Hope this clarifies your question. Just finished baking these … I’m taking them to my inlaws tomorrow for Easter and I gotta say they are absolutely delicious!! Am I reading that right? 1 1/2 POUNDS of confectioner’s sugar??? Turned out wonderful for me! Just made these cupcakes and they were such a hit! Loved the flavor of the cupcake as well as the frosting. I ran into a slight problem however which seemed to bother me much much more than everyone devouring the cupcakes- once baked, the cupcake was a lot more dense than I would have liked it to be. It didn’t have that “light and airy” texture a cupcake should have. Any ideas or suggestions as to what could have gone wrong? Should I change the type of flour used? Just a little lost because I followed the recipe exactly and I would absolutely love to make them again but the texture really discouraged me! Thanks for stopping by. Did you use cake flour? It stumps me as to why they would be dense, sometimes people complain this recipe is too light and “spongy” – I definitely would not try this recipe with all-purpose flour. I’m sorry the texture discouraged you. These cupcakes look to die for. I like the dough you use for the cupcakes, it’s seems to be very light and fluffy. Great recipe! Fantastic pictures! Looks so delicious and seems so simple to make. Thanks a lot for sharing the recipe. I can’t wait to try these!! What kind of tip do you use to get the big swirls of icing? Nothing I’ve tried looks this pretty! I used the large round tip for this cupcake. I hope this helps. Thanks for stopping by and have a great day! 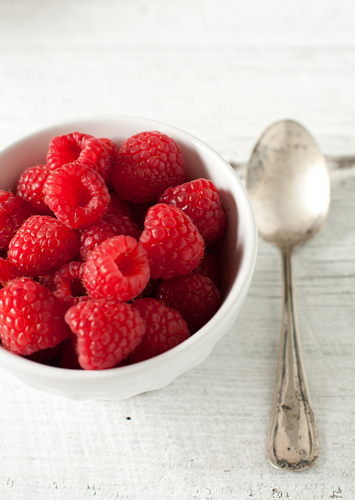 It sounds like your raspberries were a lot more juicy, but maybe not as flavorful as mine. That’s not anything you did wrong, it’s just the produce. Try going for organic berries. I find their flavor is much more intense. Do you think I can make a round cake out of this? How much do you think it makes? Heather, typically you can make 2 9″ rounds from the same amount of batter that makes 22-24 cupcakes. That’s true of pretty much any cake recipe. Hi Jamie, I was wondering with fresh raspberries being in the frosting, do you refrigerated them right away or a day or two later? I’m about to make some later today and give them away but wanted to make sure how store them till than and also let the person know how to also. Thanks! Yes, you’ll definitely want to refrigerate these cupcakes the day you make them. I take mine out of the fridge about an hour before serving. Hi! The look great! But… I don’t have any buttermilk… Could i use milk or yogurt instead? Cream? Liquid cream? You can substitute milk and lemon juice or vinegar for the buttermilk. Here are the directions http://www.thekitchn.com/how-to-make-a-quick-easy-buttermilk-substitute-cooking-lessons-from-the-kitchn-185757/. Hope this helps! Thanks for stopping by! These look so yummy . What was the wrapper made of? I have never commented on a recipe before but I had to say how perfect these are. Just the right amount of sweetness in both the batter and the frosting- not overwhelmingly sweet like some can be! Also, I have NEVER found a frosting recipe that worked out so well!! I’ve always had to modify the recipes a bit to compensate for something that just wasn’t quite right.. this is the ideal frosting. Absolutely perfect. Thank you so much for sharing this recipe!! I’m so glad you found success with the recipe! Thanks for dropping by to let me know.